KNOXVILLE — A massive banner down the side of the Neyland-Thompson Sports Center next to Haslam Field explained the reason for the activity below. With Tennessee's slogan of "DAT way" printed over an image of a player clutching a football in the middle, the sign also had "Team 121" and "Tennessee Training Camp" superimposed at its bottom. On the field, a new crop of freshmen with black stripes on their helmets ran through drills for the first time. Two hours later, players howled as they stepped into their first post-practice ice baths of the 2017 preseason. "It was a good first day to be back out here with everybody," senior linebacker Cortez McDowell said afterward. Tennessee opened preseason practice Saturday with players wearing helmets and practice jerseys — no pads — in mild temperatures. Head coach Butch Jones revealed no major epiphanies from the first of 19 practices that will lead the Volunteers into game-week preparations for the Sept. 4 opener against Georgia Tech. "But I'm pleased overall for the first day," he said. "You can get a lot out of it in terms of assignment, alignment, technique, retention of the fundamentals for the older guys from spring and the summer. But also retention of knowledge in situational football. For the newcomers, it's retention of the schemes that are going in. Right now, things are going to start to accelerate." Tennessee finished 9-4 last year with late-season losses to South Carolina and Vanderbilt derailing a would-be trip to the school's first Southeastern Conference championship game since 2007. The Vols are back with Jones preaching the "DAT way" motto. It's an acronym for "details, accountability and toughness" that now appears on Tennessee T-shirts and rubber bracelets. "Everyone took this offseason serious," fifth-year senior defensive tackle Kendal Vickers said. "We all want to get better as football players, whether it's having your nutrition right, studying in the film room, whether it's just running every day and getting your body right." A group of potential early-contributing freshmen such as offensive lineman Trey Smith and running back Ty Chandler is being indoctrinated to the emphasis on details by a cast of veterans. Those veterans are being asked to step up after the departures of Joshua Dobbs, Derek Barnett and other leaders. "You don't have to try and bite off the whole thing all at once," said junior defensive tackle Khalil McKenzie, who is back from a 2016 pectoral injury. "Just take it step by step. The first game is not until September 4. We're in July still, so we want to come tomorrow and work on something you're messing up today. It's all about continuous improvement." 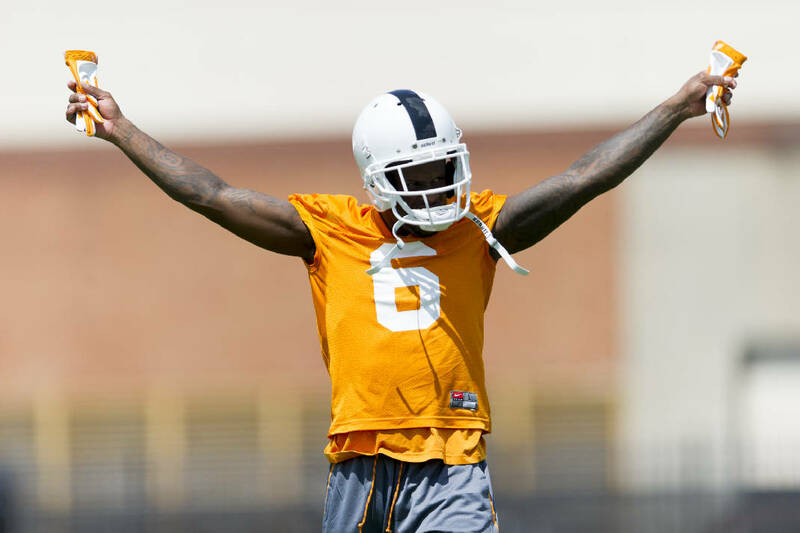 Tennessee, per NCAA rules, will not wear pads in practice until the end of this week. Freshmen and other newcomers will wear the black stripes on their helmets until it's deemed they have sufficiently been assimilated into the program. Some still will have their stripes deep into the season, but Saturday started the journey. "For the youngsters it's not just offense and defense, because now you start putting in special teams and the fundamentals and details that go along with that," Jones said. "I thought it was a very productive start. Tomorrow, again, will be a very critical day for us."